Welcome to the Aucilla Research Institute Virtual Classroom and Museum. This application explores various aspects of the natural environment and history of the North Florida region. The material provided has been selected to be of interest to a wide spectrum of viewers. In addition to photographs, some of the exhibits may be viewed in three dimensions. Please use the tabs below to navigate the Museum and to understand the objects included here. The virtual museum is set up to allow a random search through the exhibits or to search for a specific type of item based on several descriptive keys. A file of the exhibits, such as illustrated below, provides a thumbnail photo of the object together with brief descriptive information. As may be seen, the index provides a small photo of the artifact, an index number that has been assigned to that item, a one or two-word description of the item, the time period from which the artifact dates, and the material of which it is composed. Please click on the photo of an item of interest for descriptive information, or to download a digital 3-D model. Alternatively, viewers may search for all exhibits by description, time period, or material. Searching is done by entering the desired key in the boxes at the top of the screen. You can also search by entering more than one key on which to sort. Users may download 3-D models of any scanned objects of special interest, which may then be viewed in Cloud Compare, (list other programs), available through free download. Links to Cloud Compare [name other programs here] are provided here: [provide link]. Once downloaded, users may also print 3-D models of the scans. NOTE: A typical digital model of a small object is about 100 megabytes in size. Therefore, downloads may take several minutes. Paleoindian Period (14,500 – 11,000 y.b.p. ): The first human culture for this region, the Paleoindians coexisted with now extinct Pleistocene megafauna (mammoths, mastodons, etc. ), until these animals’ extinction near the end of this period. Paleoindian cultures appear to have been bands – family or kinship groups – who lived by hunting and foraging. Lanceolate stone points of various types as well as carved ivory tools are associated with this culture. The spear thrower was used as a primary hunting weapon based on evidence from Aucilla River inundated sites. Early Archaic Period (11,000 y.b.p – 7,800 y.b.p. ): Peoples of the Early Archaic lived during and immediately after the transition from the ice age at the end of the Pleistocene to the start of the Holocene – the current human era. During this period, the transition to a modern climate began. The culture of this period continued to subsist by hunting and foraging, using tools which included side-notched and later stemmed stone points, stone adzes, and stone axes. Middle Archaic Period (7,800 y.b.p. – 5,250 y.b.p. ): During the Middle Archaic Period, the climate continued its transition towards more modern conditions, reaching roughly modern sea levels and climate conditions near the end of the period. The people of the Middle Archaic continued to increase in numbers through time, developing many new forms of stemmed stone points and blades as well as many bone tools. This period also has the oldest archaeological evidence for water transportation, in the form of submerged log canoes. Middle Archaic sites are common in the Big Bend area of northern Florida. Late Archaic Period (5,250 y.b.p. – 3,150 y.b.p. ): The people of the Late Archaic Period developed the earliest known agriculture among the Native peoples of North America, cultivating goosefoot, marsh elder, and squash (curcurbita sp. ), as well as the oldest known ceramics in North America – called fiber-tempered, due to the practice of mixing plant fibers with the paste before firing. The oldest fiber-tempered ceramics in the Big Bend region are called Norwood ceramics. Deptford Period (3,150 y.b.p. – 1,800 y.b.p./200 C.E. ): The Deptford culture is the first distinctive named culture of this region, and corresponds with the beginning of the Woodland Period (ca. 3,000 y.b.p. – ca. 900 C.E.) in the eastern United States. People of the Deptford culture appear to have subsisted through living part of the year at sites on Florida’s coast and at other sites in Florida’s interior at other times. Deptford artifacts include stamped and plain ceramics, notched and triangular stone points, and bone tools which included fishing tackle. The Yent Complex is a late Deptford cultural variant associated with Florida’s west coast from Franklin County to Citrus County, along the Big Bend region. Yent Complex sites include exotic forms of ceramics. During this period, extensive trade networks were established with peoples outside of Florida. Swift Creek Culture (O C.E. – 450 C.E. ): The Swift Creek archaeological culture appears to represent a form of religious belief system which overlaps both the Deptford period and the later Weeden Island period in time. The artifacts most commonly associated with Swift Creek culture sites are complicated stamped ceramics, made with carved wooden paddles which appear to have been associated with specific potters. Bi-pointed mortuary stone blades have also been recovered from Swift Creek sites. Weeden Island Period (200 C.E. – 1000 C.E. ): Like the Swift Creek culture, the peoples of the Weeden Island culture appear to have lived in smaller villages, but to have come together to build larger ceremonial mound sites such as Kolomoki Mounds in Georgia, and the Letchworth Mounds site in this region. Weeden Island ceramics are some of the finest made in precontact North America and include incised, slipped, punctated, and other designs, including vessels made with animal effigies. The Weeden Island culture appears to have been a part of the larger sphere of Hopewell cultures of the later Woodland Period in eastern North America. Fort Walton Period (1000 C.E. – 1600 CE): The Fort Walton culture is Florida’s only true Mississipian culture. Like other Mississippian societies throughout the Southeast, people of the Fort Walton culture constructed platform mounds, practiced large-scale maize agriculture, and participated in the Southeastern Ceremonial Complex (SECC). Fort Walton ceramics appear to be derived from older Weeden Island ceramics, with shifts in tempering and the addition of Mississippian motifs to older designs. The largest concentrations of known Fort Walton culture sites are along the Apalachicola and Flint Rivers and in the “Red Hills” region of modern Leon and Jefferson Counties. Early Contact Period (ca. 1500 CE – 1633 CE): During this period, the expeditions of Panfilio de Narvaez (1528) and Hernando de Soto (1539-1540) passed through the territory of the Fort Walton peoples – the historic Apalachee Indians. After 1500, Lamar series ceramics from Georgia begin to be seen at Fort Walton culture sites, and European artifacts appear at sites within the region. With the onset of Spanish colonization of Florida in 1565, efforts to convince the Apalachee to join the Spanish mission system began in the early 1600’s, culminating in the establishment of Spanish missions in Apalachee Province by 1633. Spanish Mission Period (1633 – 1704 CE): With the establishment of missions in Apalachee Province, Leon-Jefferson ceramics, derived from the older Lamar series ceramics, become the dominant Native American ceramics found at mission sites, together with Spanish ceramics, glassware, and metal artifacts. After the establishment of Mission San Luis de Talimali in 1656, Spanish cattle ranches were also established among the Apalachee, and illicit trade with Cuba and the Caribbean took place along the St. Marks River to the Gulf. The Spanish missions in this area were abruptly destroyed or abandoned during the 1704 invasion of Spanish Florida by the English and English-allied Creek and Yamassee Indians. Late First Spanish Period (1704 CE – 1763 CE): For more than a decade, this region remained abandoned. However, with the re-establishment of Fort San Marcos de Apalache in 1718, Yamassee Indians allied with the Spanish established the town of Tamasle along the Wakulla River. The Yamassee served as intermediaries between the Spanish and the Creek Indians and British traders to the north. During this period, groups of Creek Indians also settled in Florida, some breaking away to form the emerging Seminoles (from the Spanish cimmarone, “runaway”). Ceramics from this period include Spanish and other European wares as well as Chattahoochee Brushed and grit-tempered wares. British Period (1763 – 1784 CE): Fort San Marcos was abandoned by the British by 1769, and the Yamassee Indians moved west to the Apalachicola River. Increasing numbers of Creek and Seminole Indians began to settle in the region, and were served by British traders, including the firms of Panton and Leslie. British artifacts of this period include creamware, stonewares, and other ceramics, firearms, and other goods. The British Period ended with the American Revolution and the cession of Florida back to the Spanish. Second Spanish Period (1784 – 1821 CE): During this period, Creek and Seminole settlements, including the homes of the Creek traders John and William Kennard and the Francis Town settlement along the Wakulla, continued to be established. British traders, escaped African slaves, Spanish officials and settlers as well as Native Americans vied for control of Florida, including the Big Bend region, during this period. With the onset of the Napoleonic Wars in Europe, and the War of 1812, American forces under Andrew Jackson fought their way across the Florida Panhandle in multiple campaigns, including what came to be known as the First Seminole War (1817-1818). Artifacts from this period include pearlwares, Chattahoochee Brushed ceramics, and increasing amounts of glassware at many sites. The Second Spanish Period ended with the cession of Florida to the United States in 1821. American Territorial Period (1821 – 1845 CE): With the cession of Florida to the United States, the Big Bend region with its fertile soils became a primary location for American settlement, bringing incoming settlers into conflict with the Seminoles. Increasing tensions led to the outbreak of the Second Seminole War (1835 – 1842), and a number of American military forts and garrisons were established in this area. Artifacts of this period include pearlwares, whiteware, annular wares, bottle glass, and cut iron nails. With the close of the Second Seminole War and the passage of the Armed Occupation Act, Florida Territory became a state in 1845. Typical Model being viewed in Cloud Compare Software. The image may be enlarged as desired as well as rotated and viewed from any perspective. Measurements may also be made with typical viewing software. At present, for demonstration and public comment purposes, only a few typical items have been loaded onto the site. But, as more items are inventoried, documented and scanned, the content of the virtual museum will gradually be increased. 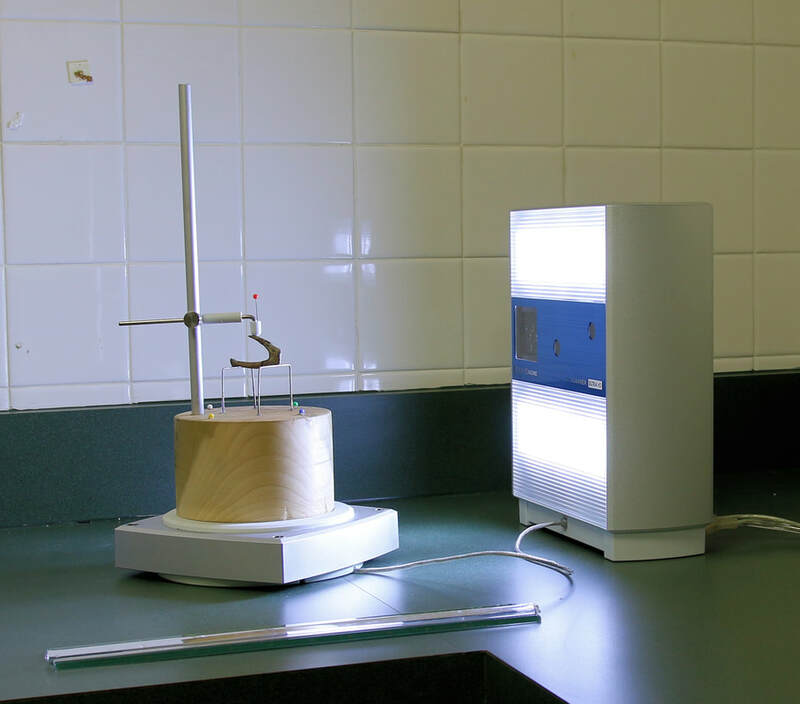 The ARI has developed an artifact scanning lab equipped with a high-resolution laser scanner associated with computer system and software. The heart of the scanning lab is a Next Engine scanner. That device "paints" the object being scanned with four bands of an infrared laser to measure distances and angles and create an amazingly dense image of 67,000 points/sq.in. 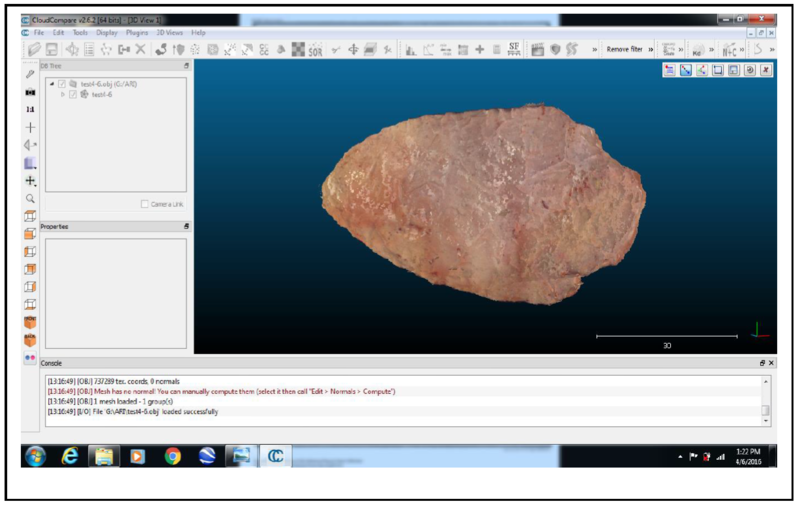 In addition to creation of the virtual museum, the scanning lab allows ARI to provide scanning services for archaeological researchers who wish to have artifacts scanned for sharing with colleagues and the public anywhere in the world. Please contact us at [contact information here] for further information. 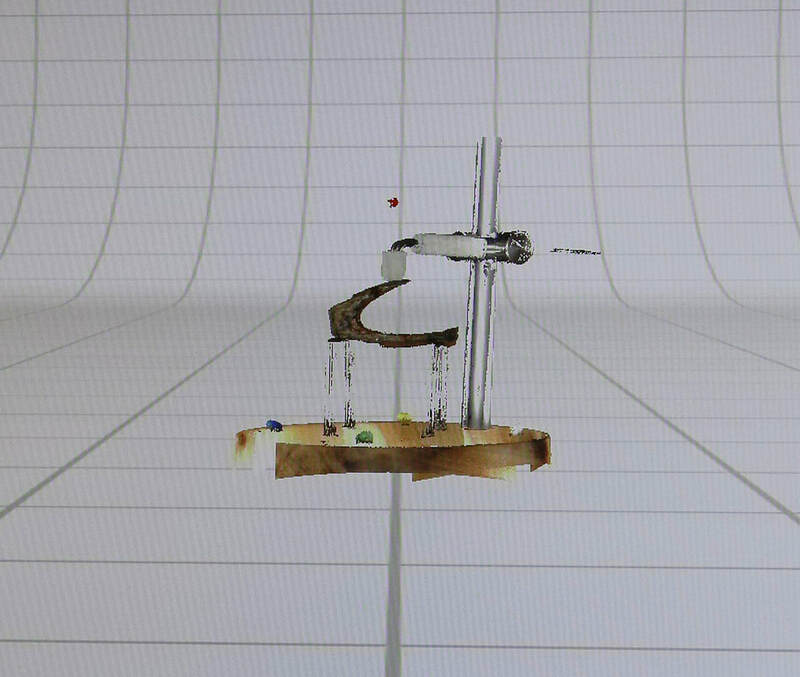 ​View a finished 3D scan in our Virtual Museum. This virtual museum has been made possible thanks to the generosity of the Louise H. and David S. Ingalls Foundation which has allowed the ARI has developed an artifact laser scanning lab for the 3-D scanning of artifacts.